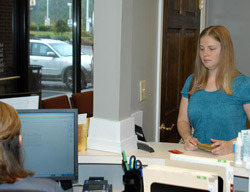 Filling in your paperwork before you come will make your first visit more enjoyable. We understand that your first visit to our office may be because you are in pain and we want to make you as comfortable as you can be during your time here. You may download and fill out our new patient paperwork prior to your first visit to help shorten your wait. Upon entering our office, you will check in at the front desk and our front desk staff will get a copy of your insurance card if you will be using insurance for your treatment. Dr. Aaron or Dr. Jamie will then introduce him or herself and bring you back to their office where they will acquire a complete history of your health and/or current condition. Various examinations will help determine whether chiropractic can help you. Next you will receive a thorough orthopedic and neurological examination. 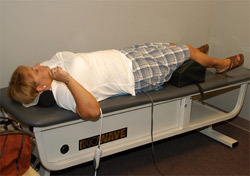 Included in this examination will be a thermal and electromyographic scan to test the function of your nervous system. You may also receive a digital foot scan to determine your need for custom made foot orthotics that we offer through Foot Levelers. After the examination is complete you may receive x-rays if Dr. Ornburn deems them necessary. Depending on what area is exposed, you will need to remove all metal objects (earrings, necklace, belt, etc.) and wear a gown. Most patients receive traction treatments. After the x-rays are taken you will go to the therapy room where you will be able to lay on our traction table and receive treatment using our electrical stimulation unit. These treatments help increase your mobility and decrease muscle tightness. After your ten minutes of therapy is complete, you will check out at the front desk where you will then schedule your next appointment. Call Synergy Chiropractic now to schedule an appointment and let’s see how chiropractic care can help you!